Tomorrow morning NASA’s Mars Science Laboratory (MSL), “Curiosity”, will touch down on the Martian surface after a nearly 9 month, 567 million kilometre journey. 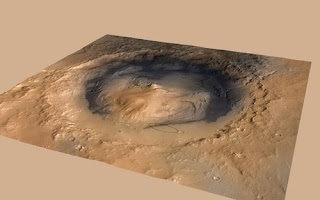 Its destination, the foot of a mountain inside Gale Crater, which was formed when a meteor hit Mars 3.5-3.8 billion years ago. There will be live coverage of the event on NASA TV leading up to and throughout the landing. The landing is scheduled for 05:31 UTC (which is 06:31 GMT, 22:31 PDT, 01:31 EDT). This mission not only represents the next step in preparations for man’s leap towards the stars but also leaps in technology and innovation never before attempted and if you watch this video, which featured as Astronomy Picture of the Day on July 31st 2012 you might get some idea as to why. Ian O’Neill the Space Science Producer for Discovery News also explains Curiosity’s role on Mars and how it compares to previous Martian missions and what makes it so special. 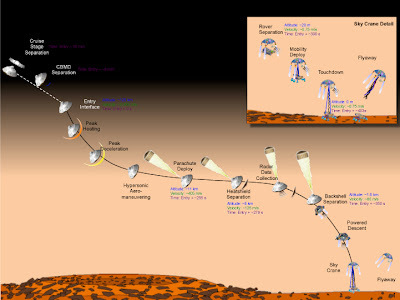 If NASA are able to ‘stick the landing’, and I am sure all who are watching will have their fingers firmly crossed; then, thanks to Curiosity and the instruments carried on-board we will learn the biological history of our rust red neighbour and perhaps lay the ground work for creating its future.